Family travel | Pineapple Press, Inc. If you think Orlando, Florida, is only about everything Disney, you’re missing out. Orlando was once an open frontier where cattle were herded to market, fortunes were made and lost, and citrus was king. Thomas Cook is a photographer and historian who specializes in the history of central Florida. He has called Orlando home since 1984 and has worked for the University of Central Florida’s History Department, the Orange County Historical Society, and the Orlando Public Library. 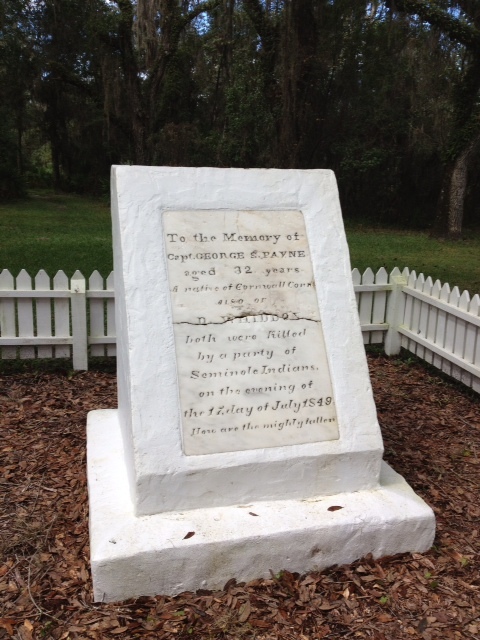 He has also lectured and written numerous magazine articles on central Florida history. His love of history and his interest in the paranormal compelled him to create Orlando’s first professional ghost tours in 2000. I’ve always wondered what Bowling Green, Florida is like. Well, it’s like many small Florida towns, except it offers up Paynes Creek Historic State Park. Here you’ll find a lot of history. The unfortunate part is that you won’t find the fort or a replica. However, this shouldn’t deter the history buffs or someone who wants to enjoy a fun day in a clean state park. I think the design of this park and the state of its facilities cannot be beat. It’s a great place for kids. It wasn’t busy on the day we went, but that was nice for a change. And I’ve never seen cleaner restrooms! They have a hike to the site of the fort, along with some hikes that take you to historical markers and the meeting of the Peace River and Paynes Creek. That is one fast-moving body of water too. That alone is fun to see. They also have a nice visitors center that offers up a small exhibit of the history of the area. There you can read about the massacre that happened there and see a partial replica of the trading post that used to exist there. It’s a good starting point for anyone traveling to all the state parks or for those that want to visit the big historical sites in Florida. Hillsborough River State Park is a real gem. Though I’ve lived near it for most of my life, I recently took my first visit there. One of the coolest aspects is the large pool. While it is closed in winter, we could still see how fun it would be for the summertime. They also have a large amount of picnicking spots that come with playgrounds and some good area for biking. The numerous trails accommodate many levels of hikers. Perhaps the coolest one takes you by the suspension bridge that is fun for all. Hillsborough River is also one of the few places to see rapids in the area and makes this park all that more unique. If this plethora of outdoor activity isn’t enough, it’s not every day you get to visit a fort. While this one is only a replica, it is still an awesome sight! Fort Foster is a short tram ride through Hillsborough River State Park. Once upon Fort Foster, you are greeted with a large, oval wall made of wooden posts. For more, see our earlier post on Fort Foster. It’s not every day you get to visit a fort. But luckily for Floridians, we have several. 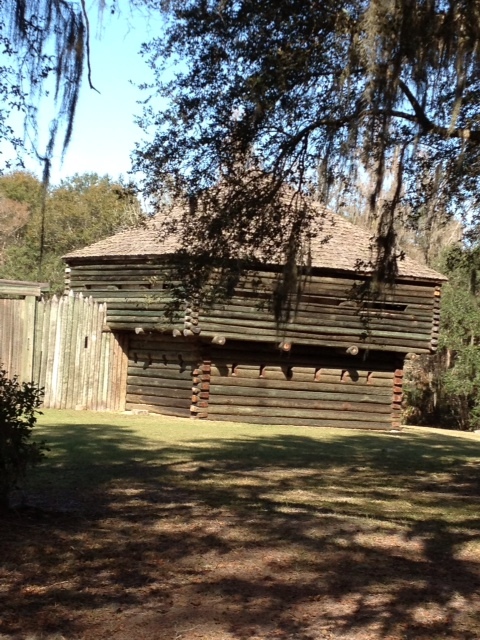 One such fort is Fort Foster, at Hillsborough River State Park in Thonotosassa, Florida. While it is only a replica, it is still an awesome sight! Once upon Fort Foster, you are greeted with a large, oval wall made of wooden posts. The massive amount of beams that make up this historical place is mind-blowing. Inside, you find buildings made of the same material. There are a few different buildings inside, along with a large cannon. You can look out the cannon door, as well as out most of the “windows” along the wall. 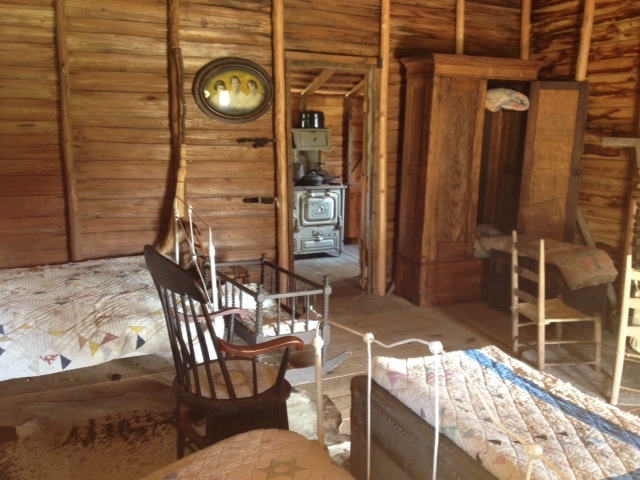 Most of the buildings in the fort have old props and furnishings reminiscent of the time, ones that are often used in the living history events the park has from time to time. It’s fun to hear the stories of these props and envision in how they might have been used. A trip to Fort Foster is not to be missed. The accompanying Hillsborough River State Park is also a pretty cool place, with its large pool and picnicking spots. Who says Florida doesn’t have mountains? Well, we all know it doesn’t really. However, experiencing that feeling in a state park in the lower part of Florida is somewhat of an anomaly. But, Alafia River State Park offers that and more. Bikers rejoice, cause if you like rugged trails—this park is for you. Hikers and families will also find plenty to do in this beautiful spot. Florida has some breath-taking beauty–but sometimes all those palmettos get a bit tiresome. In addition, the Alafia River State Park offers a break from that. While the palmettos are present, the biggest takeaway might be the awesome green water. Now, green water might sound off-putting, but here it is a beautiful light green color that you don’t see too often. The light that filters through the enormous trees and around the tall “mountains” really sets a fairy-like mood for the park that you won’t experience at most of the state parks I’ve been to. Here you feel like you’ve fallen into an enchanted forest. Yes, there is a Christmas, Florida. They’ve created an awesome replica of the fort with great historical exhibits and an interesting historical park. Perhaps the other thing you’ve heard about in Christmas, Florida is the post office there. Your mail will be posted with “Christmas, Florida” and who wouldn’t want that on their Christmas cards? Maybe a December visit is in order? 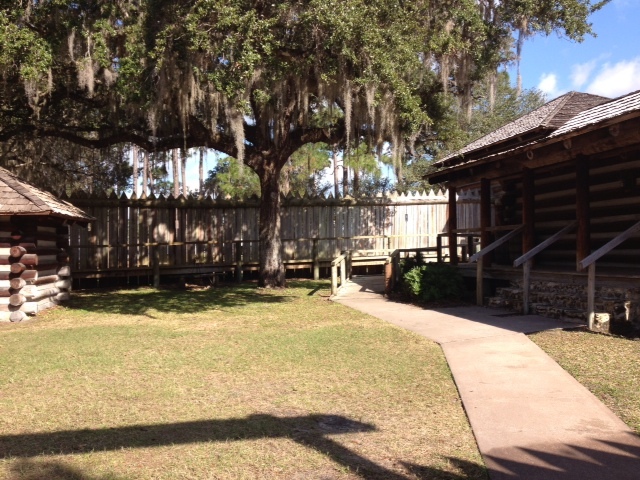 Once you get to Fort Christmas, you are greeted with a huge replica of the original fort. The beams are impressive and well placed. It has nice signage that discusses the fort and the wars it was involved with also. Once inside the fort you’ll find an impressive historical display. They have collected tons of artifacts that you don’t see every day. The displays discuss war history, local history, Seminole history, and more. Much of the display discusses local history, which is especially neat once you see the connected historical park. In fact, I might consider visiting the historical park first—because the exhibits in the Fort are even more interesting when you have that context. The houses belong to early residents of the town. They have signage and pictures discussing what the occupants did and a little about them. Then you got to see clothing, accessories, cookware, and such from those times. It was neat to see how they lived and how their homes were built. Run by the county, you can enjoy a fun few hours at Fort Christmas. The area comes with a playground, picnic tables, and restrooms. It is not a daylong adventure, so perhaps you want to also plan on a trip to Dixie Crossroads restaurant in Titusville. This was my first visit there, and the fritters are not to be missed. 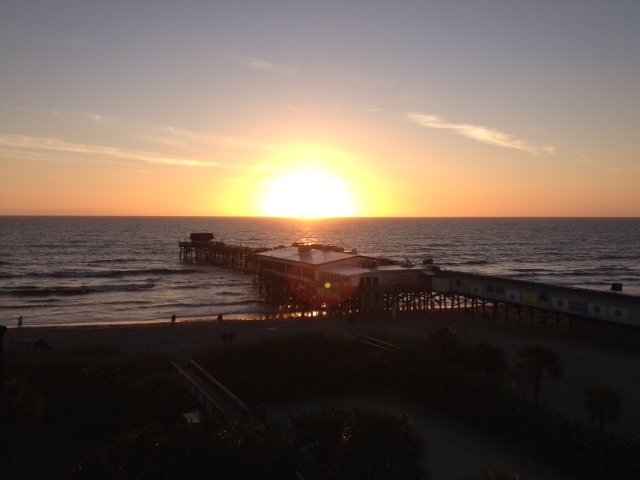 Being a west coast girl, I was a little shocked not to see the sunset at Cocoa Beach. But, the sunrise on Cocoa is awesome! We were right by the pier on Cocoa, another first for me. Walking under the pier was a little like being in a movie, and it was a fun experience. We never made it on the actual pier, but I’d like to go back someday to try it. It seems to offer food, drink, and live music. Another fun sight is the surfers. Their dedication to their sport is really admirable, especially when you see how high some of those waves are. And they all look so strong! As for the local area, we hit Ron Jon’s of course and sampled the Backwoods Grill and I Dream of Yogurt. It was neat to drive around and see Patrick Air Force Base, if only from the road. That area of Florida is different from the smaller and less developed beach areas that the suncoast of Florida offers. You really will feel like you are in a beach town like you see in those old movies. Or perhaps it will have that Jersey shore feel you’ve been looking for. On the way to Cocoa Beach, we stopped at Dixie Crossroads and sampled some fried mullet and other seafood. This a great family experience, especially the fritters with powdered sugar. You might want to make sure you also take this route! Those that frequent only one coast of Florida really miss out. Both coasts are so different that you need both to get a true Florida experience. I’ll remind myself of that next time I think it might be too far to drive over there. Into food and wine? Then you need to make plans to attend this fun event. The Eighth Annual Beaufort Wine & Food Weekend will be held April 25 – 29 in Beaufort, North Carolina. There are lots of special events to choose from, but a few are already sold out. Ticket cost depends on the event, ranging from free to $95 for gourmet wine dinners. It is one of the largest outdoor wine festivals in the state, but winemakers come from as far as Sonoma, California. And this years promises to be spectacular with an A-list of chefs participating. One of the chefs participating this year is Chef/Owner Scott Howell of Nana’s in Durham. Nana’s is ranked as one of the top twenty best organic restaurants in America and has won Wine Spectator’s “Award of Excellence” for its wine menu. But I’m especially excited about Chef Nathan Thurston. He is the top chef at one of my favorite restaurants, Ocean Room at The Sanctuary Resort on Kiawah Island. I know firsthand why he’s won numerous American Culinary Federation competitions. There will be lots of special events, such as wine and cheese tastings with live music, seminars, wine dinners, a contest for the best bartender concoction, and cooking demonstrations. If you’d rather have a cold beer than a glass of Riesling, then plan to attend on Saturday, April 28. There will be barbeque from a couple of top pit masters and some great beer breweries, such as Sierra Nevada and Natty Greene Brewing Company, will be featured. The event is a fundraiser for the Beaufort Historical Association and the NC Maritime Museum at Beaufort. So, be sure to drink and eat lots in the name of charity! An ORV permit will be required from now on. You must not exceed the speed limit, which is 15mph, unless otherwise posted. There are two types of permits issues: ($50) weekly and ($120) annually. Note: No day rate but there is limited access on Hatteras and Ocracoke beaches. Ocracoke Island by the NPS visitor center (40 Irvin Garrish Highway, Ocracoke, NC). You must have a valid driver’s license and vehicle registration. You will be required to fill out a form, pay the money, and watch a brief educational video. For more information, call 252-473-2111 or visit the park website at: www.nps.gov/caha.